Saturday December 24th 1898 We got up early as Charlie wanted to got up town for the train west. I got ironing and morning work done and in the afternoon Will ad I went up to Stevens. came home to do evening work and read after supper. 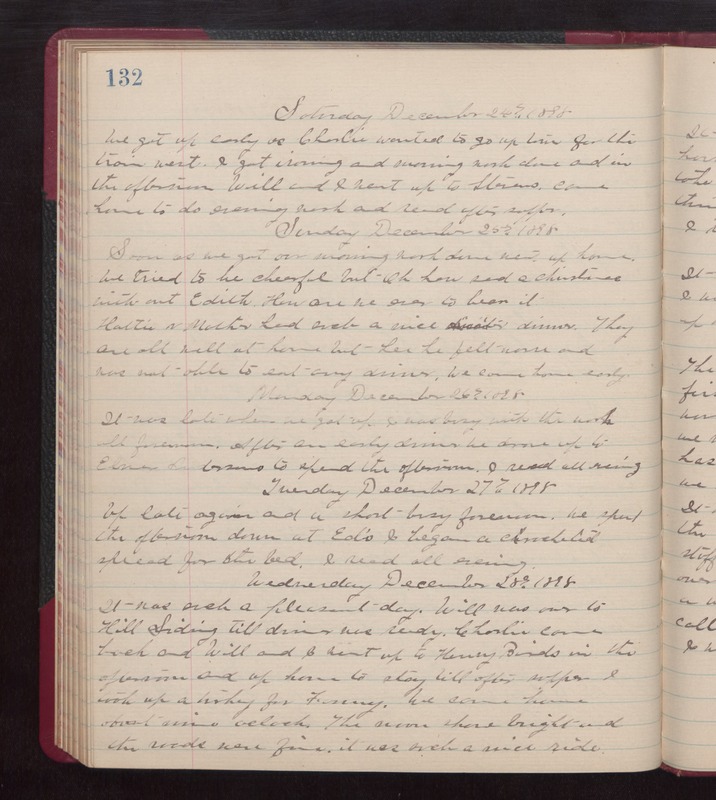 Sunday December 25th 1898 Soon as we got our morning work done went up home. we tried to be cheerful but Oh how sad a christmas without Edith. How are we ever to bear it. Hattie & Mother had such a nice dinner. They are all well at home but Lee, he felt [warm?] and was not able to eat any dinner. we came home early. Monday December 26th 1898 It was late when we got up. I was busy with the work all forenoon. After an early dinner we drove up to Elmer Andersons to spend the afternoon. I read all evening. Tuesday December 27th 1898 Up late again and a short busy forenoon. We spent the afternoon down at Ed's. I began a crocheted spread for the bed. I read all evening. Wednesday December 28th 1898 It was such a pleasant day. Will was over to Hill Siding till dinner was ready. Charlie came back and Will and I went up to Henry Birds in the afternoon and up home to stay till after supper. I took up a turkey for Fanny. We came home about nine oclock. The moon shone bright and the roads were fine, it was such a nice ride.